Yesterday was day two of my Greensboro artist collaborations, and lemme tell you- we had a BALL. If you can't tell, Angie has a super dreamy studio space that served up enough inspiration for the whole afternoon. We opened the windows, drank our coffee, chitted and chatted (does that work? maybe? ), and just had a good ole time. For this collaboration, Angie and I wanted to create something that felt 100% her and 100% me (kind of goes without saying, but yknow. we wanted to be sure we kept that at the front of our minds with this). 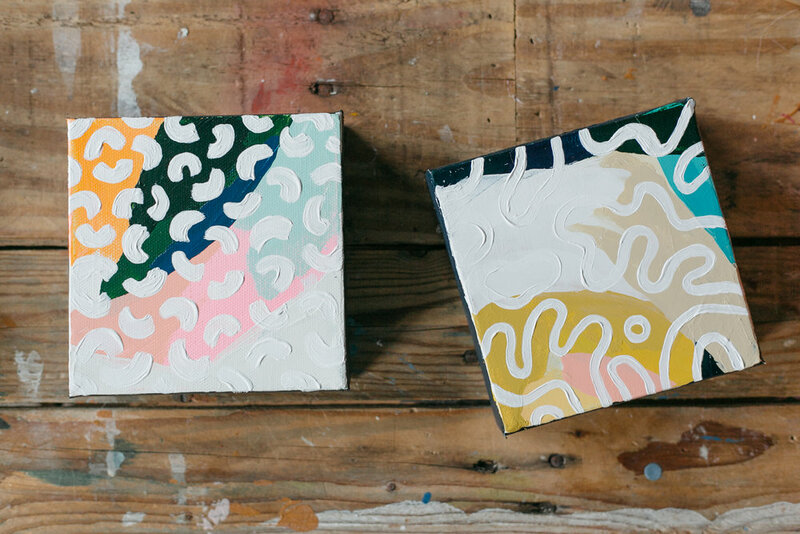 She painted two mini canvases in her signature style: palette knife swatches of brilliant colors. I came back over them with white paint and added some happy little shapes. I am in looove with how they turned out! Some more photos are below. Hit that <3 button if you want to see more of this kind of post. You can check out the rest of Angie's work here!